Bimal Gurung today said he felt like a "joker" wearing the traditional Nepali attire, daura sural, as hardly any party leader or worker wore it at the Gorkha Janmukti Morcha's foundation day programme here. Gurung and his wife Asha, who is a GTA Sabha member, were the only senior Morcha leaders to wear the traditional dress at the event to mark the 10th anniversary of the Morcha. "I am feeling lonely today. The day used to be celebrated like a festival. Today, looking around, I feel that daura sural is not our community's dress. 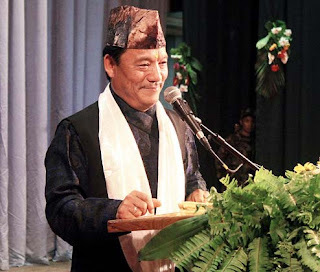 It seems like someone has taken away our topi (headgear)," Gurung said at the Gorkha Rangamanch Bhavan. "I have become a joker today (for wearing the dress.). It is not enough to just bring out rallies and raise slogans. We have to show that we are different (from Bengal). Also, wearing our traditional dress should be a matter of pride. It is an issue of our dignity," he said. While the traditional Napali attire for a man is called daura sural, the female attire is called chaubandi choli. None of the senior Morcha leaders, including party general secretary Roshan Giri, assistant general secretary Binay Tamang, GTA Sabha members, Ramesh Lama and others, were in the traditional dress. Among the 700-odd people at the auditorium today, only about 10 per cent were seen wearing the traditional dress. "I am neither scolding you nor dictating anything. I am proud of my dress and I will wear it for a month from today. I do not care if others wear it or not," Gurung said. In 2008, Gurung had directed that all hill residents should wear the traditional dress for a month during the Puja season to show that the hill people were different. That year, some alleged Morcha cadres had blackened the faces of some Darjeeling residents who were found not wearing the traditional attire. The diktat was criticised by many, following which Gurung said that from the following year, he would leave it to the the hill people to decide whether to wear the dress or not. In 2009, while most Morcha leaders were seen in the traditional attire on important days and also in the festive month, very few residents wore it. Over the past couple of years, even Morcha leaders have stopped wearing the dress.